For other uses, see Bioenergy (disambiguation). Bioenergy is renewable energy made available from materials derived from biological sources. Biomass is any organic material which has stored sunlight in the form of chemical energy. As a fuel it may include wood, wood waste, straw, and other crop residues, manure, sugarcane, and many other by-products from a variety of agricultural processes. 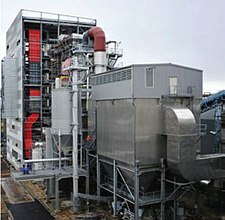 By 2010, there was 35 GW (47,000,000 hp) of globally installed bioenergy capacity for electricity generation, of which 7 GW (9,400,000 hp) was in the United States. There is a slight tendency for the word bioenergy to be favoured in Europe compared with biofuel in America. Simple use of biomass fuel (Combustion of wood for heat). One of the advantages of biomass fuel is that it is often a by-product, residue or waste-product of other processes, such as farming, animal husbandry and forestry. In theory this means there is no competition between fuel and food production, although this is not always the case. Land use, existing biomass industries and relevant conversion technologies must be considered when evaluating suitability of developing biomass as feedstock for energy. Biomass is the material derived from recently living organisms, which includes plants, animals and their byproducts. Manure, garden waste and crop residues are all sources of biomass. It is a renewable energy source based on the carbon cycle, unlike other natural resources such as petroleum, coal, and nuclear fuels. Another source includes Animal waste, which is a persistent and unavoidable pollutant produced primarily by the animals housed in industrial-sized farms. There are also agricultural products specifically being grown for biofuel production. These include corn, and soybeans and to some extent willow and switchgrass on a pre-commercial research level, primarily in the United States; rapeseed, wheat, sugar beet, and willow (15,000 ha or 37,000 acres in Sweden) primarily in Europe; sugarcane in Brazil; palm oil and miscanthus in Southeast Asia; sorghum and cassava in China; and jatropha in India. Hemp has also been proven to work as a biofuel. Biodegradable outputs from industry, agriculture, forestry and households can be used for biofuel production, using e.g. anaerobic digestion to produce biogas, gasification to produce syngas or by direct combustion. Examples of biodegradable wastes include straw, timber, manure, rice husks, sewage, and food waste. The use of biomass fuels can therefore contribute to waste management as well as fuel security and help to prevent or slow down climate change, although alone they are not a comprehensive solution to these problems. Biomass can be converted to other usable forms of energy like methane gas or transportation fuels like ethanol and biodiesel. Rotting garbage, and agricultural and human waste, all release methane gas—also called "landfill gas" or "biogas." Crops, such as corn and sugar cane, can be fermented to produce the transportation fuel, ethanol. Biodiesel, another transportation fuel, can be produced from left-over food products like vegetable oils and animal fats. Also, Biomass to liquids (BTLs) and cellulosic ethanol are still under research. The use of municipal and household waste is on the forefront of new sources for biomass, and is a largely discarded resource on which new research is being conducted for use of energy production. A new bioenergy sewage treatment process aimed at developing countries is now on the horizon; the Omni Processor is a self-sustaining process which uses the sewerage solids as fuel to convert sewage waste water into drinking water and electrical energy. Sewage sludge is a point of focus in current research for developing bioenergy from biomass. The large quantity being produced by households at a continuous rate presents an opportunity to extract valuable compounds contained within it which can be then used to produce bioenergy. The main form of bioenergy being produced from sewage is methane, but producing other forms is still being researched. The use of sewage to produce methane reduces the amount of waste put into landfills, its costs of transportation and disposal, and also keeps a larger amount of gas out of the atmosphere, as more is able to be captured. . The biomass used for electricity production ranges by region. Forest byproducts, such as wood residues, are popular in the United States. Agricultural waste is common in Mauritius (sugar cane residue) and Southeast Asia (rice husks). Animal husbandry residues, such as poultry litter, is popular in the UK. Sugarcane (Saccharum officinarum) plantation ready for harvest, Ituverava, São Paulo State. Brazil. A sugar/ethanol plant located in Piracicaba, São Paulo State. This plant produces the electricity it needs from bagasse residuals from sugarcane left over by the milling process, and it sells the surplus electricity to the public grid. Sucrose accounts for little more than 30% of the chemical energy stored in the mature plant; 35% is in the leaves and stem tips, which are left in the fields during harvest, and 35% are in the fibrous material (bagasse) left over from pressing. The production process of sugar and ethanol in takes full advantage of the energy stored in sugarcane. Part of the bagasse is currently burned at the mill to provide heat for distillation and electricity to run the machinery. This allows ethanol plants to be energetically self-sufficient and even sell surplus electricity to utilities; current production is 600 MW (800,000 hp) for self-use and 100 MW (130,000 hp) for sale. This secondary activity is expected to boom now that utilities have been induced to pay "fair price "(about US$10/GJ or US$0.036/kWh) for 10 year contracts. This is approximately half of what the World Bank considers the reference price for investing in similar projects (see below). The energy is especially valuable to utilities because it is produced mainly in the dry season when hydroelectric dams are running low. Estimates of potential power generation from bagasse range from 1,000 to 9,000 MW (1,300,000 to 12,100,000 hp), depending on technology. Higher estimates assume gasification of biomass, replacement of current low-pressure steam boilers and turbines by high-pressure ones, and use of harvest trash currently left behind in the fields. For comparison, Brazil's Angra I nuclear plant generates 657 MW (881,000 hp). Bagasse burning is environmentally friendly compared to other fuels like oil and coal. Its ash content is only 2.5% (against 30–50% of coal), and it contains very little sulfur. Since it burns at relatively low temperatures, it produces little nitrous oxides. Moreover, bagasse is being sold for use as a fuel (replacing heavy fuel oil) in various industries, including citrus juice concentrate, vegetable oil, ceramics, and Tyre Recycling. The state of São Paulo alone used 2,000,000 tonnes (1,970,000 long tons; 2,200,000 short tons), saving about US$35 million in fuel oil imports. Researchers working with cellulosic ethanol are trying to make the extraction of ethanol from sugarcane bagasse and other plants viable on an industrial scale. Another form of bioenergy can be attained from microbial fuel cells, in which chemical energy stored in wastewater or soil is converted directly into electrical energy via the metabolic processes of electrogenic micro-organisms. The power generation capability of this technology has not been found to be economically viable till date, however, this technology has found been found to be more useful for chemical treatment processes  and student education. Some forms of forest bioenergy have recently come under fire from a number of environmental organizations, including Greenpeace and the Natural Resources Defense Council, for the harmful impacts they can have on forests and the climate. Greenpeace recently released a report entitled Fuelling a BioMess which outlines their concerns around forest bioenergy. Because any part of the tree can be burned, the harvesting of trees for energy production encourages Whole-Tree Harvesting, which removes more nutrients and soil cover than regular harvesting, and can be harmful to the long-term health of the forest. In some jurisdictions, forest biomass is increasingly consisting of elements essential to functioning forest ecosystems, including standing trees, naturally disturbed forests and remains of traditional logging operations that were previously left in the forest. Environmental groups also cite recent scientific research which has found that it can take many decades for the carbon released by burning biomass to be recaptured by regrowing trees, and even longer in low productivity areas; furthermore, logging operations may disturb forest soils and cause them to release stored carbon. In light of the pressing need to reduce greenhouse gas emissions in the short term in order to mitigate the effects of climate change, a number of environmental groups are opposing the large-scale use of forest biomass in energy production. The New Scientist described a scenario in a September 2016 article which illustrated why the journal believed bioenergy can be bad: Suppose you cut down a 50-year oak tree in your garden and use the logs to heat your house instead of coal. Wood emits more carbon dioxide than coal per unit of heat gained and the roots left in the soil emit more carbon dioxide as they rot. If you plant another tree it will soak up that carbon dioxide in about 50 years. But if you had left the original tree in place it would have soaked up the carbon dioxide from the coal and more. It could take centuries before cutting down the tree would give any benefit. But the world needed to cut carbon dioxide over the next few decades if the global warming was to be kept below 3 degrees C. The journal also concluded that official claimed carbon reductions from renewables had been overstated. The European Union, for example, got more 64% of its renewable energy from biomass (mostly wood) but United Nations and EU rules did not count the carbon emissions from burning biomass. Recently, a new company called Mango materials used bacterial fermentation to produce an intracellular biopolymer, polyhydroxyalkanoate from methane. The great advantage of biopolymers is that it is biodegradable which makes it environment friendly. Because methane is being used that decreases the price of polymers that it would compete with traditional plastics. Also, because methane would be converted into biopolymer that would reduce methane emissions. Chief Executive Officer Molly Morse said that the unused methane would be enough to produce more than three billion pounds of biopolymer. Morse announced in 2017 that using this polymer will reduce the waste in the textile industry because it will be reproduced as biopolymer again in every effective industrial loop. ^ "Crop Residue". Defined Term.com. Retrieved 2018-10-21. ^ "What is bioenergy?". Växjö University, Bioenergy Technology Department. Archived from the original on 23 August 2010. ^ "Definition: Bioenergy | Open Energy Information". en.openei.org. Retrieved 2016-10-23. ^ Cho, Renee (2011-08-18). "Is Biomass Really Renewable?". Earth Institute. Columbia University. Retrieved 2016-10-01. ^ Davis, Sarah C.; Boddey, Robert M.; Alves, Bruno J. R.; Cowie, Annette L.; George, Brendan H.; Ogle, Stephen M.; Smith, Pete; van Noordwijk, Meine; van Wijk, Mark T. (2013-11-01). "Management swing potential for bioenergy crops". GCB Bioenergy. 5 (6): 623–638. doi:10.1111/gcbb.12042. ISSN 1757-1707. ^ "Having Power With Biomass Alternative Energy". www.biomass.net. Retrieved 2017-09-11. ^ "Janicki Bioenergy website". Archived from the original on 9 January 2015. Retrieved 11 January 2015. ^ "BBC news article "Bill Gates drinks water distilled from human faeces"". BBC News. 2015-01-07. Retrieved 11 January 2015. ^ "Watch Bill Gates Sip Water Made From Sewer Sludge". Forbes. Retrieved 12 January 2015. ^ Rulkens, Wim (2008). "Sewage Sludge as a Biomass Resource for the Production of Energy: Overview and Assessment of the Various Options" (PDF). Energy and Fuels. Retrieved 2018-10-21. ^ Pyper, Julia (December 22, 2011). "Can New Waste Treatment Make Energy and Profits from Sewage Plants?". Scientific American. Retrieved 2018-10-21. ^ "- Cambrian Innovation - Biology For a Cleaner Planet™". Cambrian Innovation. Retrieved 28 February 2015. ^ MudWatt. "MudWatt Science Kit". MudWatt. Retrieved 28 February 2015. ^ "NRDC fact sheet lays out biomass basics, campaign calls for action to tell EPA our forests aren't fuel". nrdc.org. Retrieved 28 February 2015. ^ "New Process Being Tested for Biodegradable Plastics". Energy.gov. Retrieved 2018-01-31. ^ "New Process Being Tested for Biodegradable Plastics". Energy.gov. Retrieved 2018-02-10. ^ "The Shirt Of The Future Will Be Made By Methane-Eating Bacteria". Fast Company. 2017-10-03. Retrieved 2018-02-10. Biomass Reports (Idaho National Laboratory). Research about the intersection of bioenergy, agriculture, and food security by the International Food Policy Research Institute. Bioenergy (US Department of Energys Office of Energy Efficiency and Renewable Energy). This page was last edited on 26 March 2019, at 14:13 (UTC).